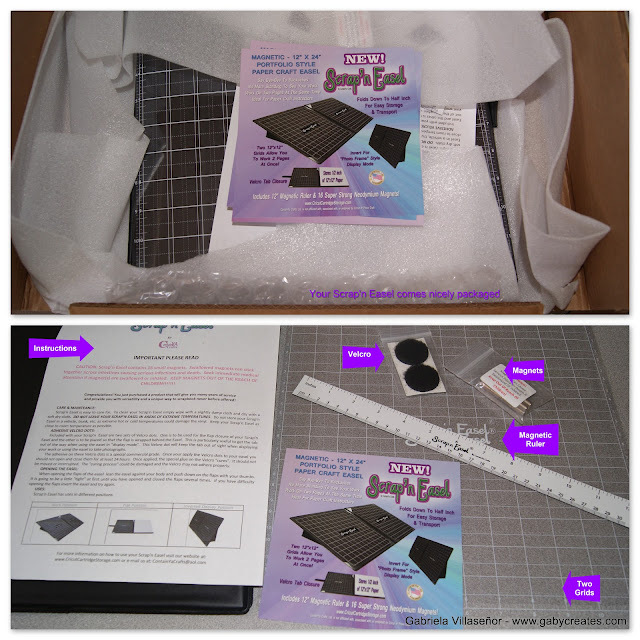 How to set up your Scrap'n Easel and how I used the Scrap'n Easel to assist me in creating a layout. Your box arrives with its contents very nicely packaged. After you open your box take out your Scrap'n Easel, two (2) clear Grids, one (1) magnetic Ruler, one clear bag containing 16 super strong Neodymium Magnets, one clear bag containing Velcro Dots and your Instructions. Move your two clear Grids, magnetic Ruler, Magnets, Velcro Dots and your Instructions to the side and open up your Scrap'n Easel. It is a very easy process. Just guide the Grids with you fingers. This is what it looks like after both Grids have been placed in the corner tabs. You are ready to work on it if you wish. But there are a few more steps to setting it all up and looking at all the options you have. Close you Scrap'n Easel and place towards you the thicker part-- it is very noticeable. Lift the Scrap'n Easel flap and push to attached (thicker) insert toward the bottom. You may want to use a little bit of force here or use both hands to pull/push (depending on your body's position in relation to the Scrap'n Easel)-- it will not hurt it, promise! Top view of one side/flap of the Scrap'n Easel open. Top view of both sides/flaps of the Scrap'n Easel open. This is a back view of your Scrap'n Easel in the Display position. This is a front view of your Scrap'n Easel in the Display position. Setting up your Scrap'n Easel for the "Work" position. All you do is invert your Scrap'n Easel! Yes, that easy. 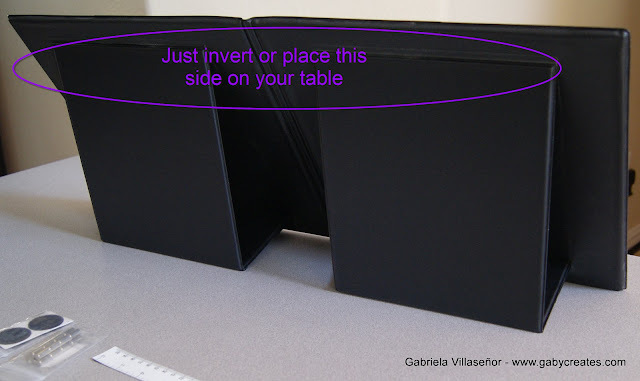 Flip over/invert and place on your table. Now when you are ready to put it away you may close it down by releasing the adhered flaps and folding it. In your package you receive a Velcro dot that you may use (I chose not to use it on mine) to secure it. 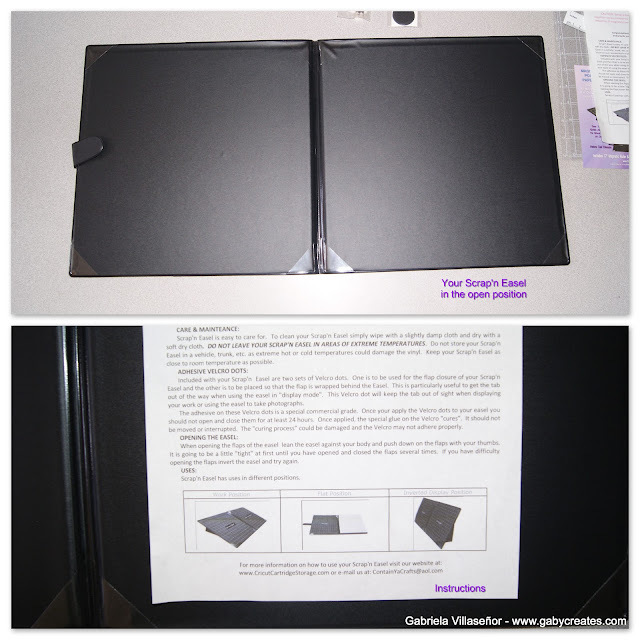 Adhere your Velcro Dot to the Tab Closure and to the opposite side of the back of your Srap'n Easel. I hope this helped you set your Scrap'n Easel up. Now for Part II or creating a layout with the assistance of the Scrap'n Easel. First Step: I placed my 12"x12" piece of PP on my Scrap'n Easel and held it secure with the magnets. Step Two: I placed the magnetic ruler at 11 1/2" from bottom up using the lines on the grid and ensuring that my magnetic ruler and my PP matched at the 1" and 12" marks. Step Three: Since my second layer/paper was sized at 11"x11" I wanted to make sure that my paper was centered or squared. The ruler and the Grid helped me accomplish just that. Here (above) you can see that my white paper sits right on the 1/2" and the 11 1/2" marks (sides and bottom) and that I am securing it using 4 of the Magnets. Step Four: Now I want to place my photo mat and align it vertically. Using the magnetic Ruler I guided the Ruler using the Grid. Here you can see that not only was I able to align it vertically, but at the 2" from top to bottom. Step Five: For this step I want to place/line up a piece of "notebook" paper across. Once again, using the magnetic Ruler I was able to accomplish that. Step Six: By holding everything in place with the Magnets I was able to design my layout up to the placement of my die cuts. I wanted to see which die was the best size for my layout. I was able to take and add pieces until I was satisfied with one or the right size. Step Seven: Here the magnetic Ruler was used again to guide me in placing my title in a straight line. Step Eight: Now that I am satisfied with the placement I started permanently adhering all my pieces. Last Step: After adhering everything and adding bits and pieces and some sewing, I am ready to use my Scrap'n Easel to take my pictures! I followed the sketch pretty closely! I even had my Silhouette draw a similar design using the Chomas adjustable pen holder. 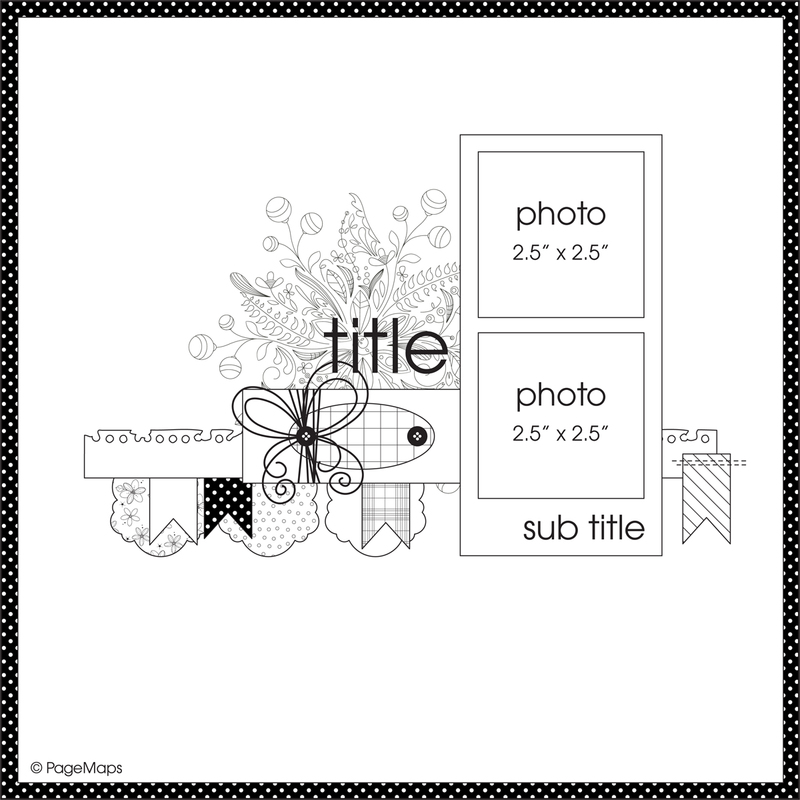 I was even able to alter the design using the DesignStudio software with my Cameo (the flower you see to the farthest left was added and a little heart below the flower below that one-- pretty cool). 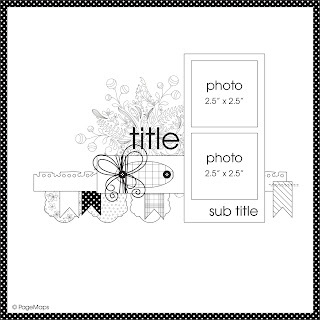 Scrap'n Easel is a "double" magnetic paper craft easel, but for those of you that are more of a card maker, there is a single easel -- the Scrap'n Easel-Ette Card Crafter that you can pre-order now!